A tentative one-year contract calls for a 10.5 percent raise for 6,000 Seattle Public Schools employees, according to an email sent Saturday to members of the Seattle Education Association. The deal, reached late Friday, also includes five additional days of paid parental leave for teachers and substitutes, classified staff and office personnel. School will start as scheduled on Wednesday, Sept. 5. Union members and the School Board will vote on the contract this month. Saturday’s email was signed by Phyllis Campano and Michael Tamayo, the union’s president and vice president. Campano could not be reached immediately for comment. The district confirmed the information in an email. More details on the Seattle contract were not immediately available. Their message noted that the union’s 2015-2018 contract had been extended through Sept. 9. The raise and other benefits in the new agreement would be retroactive to Aug. 31, when the current contract expired. Under the 2015-2018 contract, Seattle teachers earn between $50,604 and $100,763. A 10.5 percent hike would change the salary range to $55,984 to $111,343. While 10.5 percent may appear hefty, teachers in neighboring districts have secured even higher salary bumps. Teachers in Bellevue, Lake Washington and Snoqualmie Valley schools will soon see their paychecks rise by as much as 14-25 percent under new contracts agreed to this summer. In Everett, a starting teacher will earn $54,677 while the most experienced colleagues will take home $120,776. The maximum salary now offered in Edmonds, Lake Washington and Shoreline schools will top $114,000; $112,000; and $120,000, respectively. The union’s board of directors will review “documents and summaries” Tuesday evening. Following that review, the general membership will get more information, the email said. 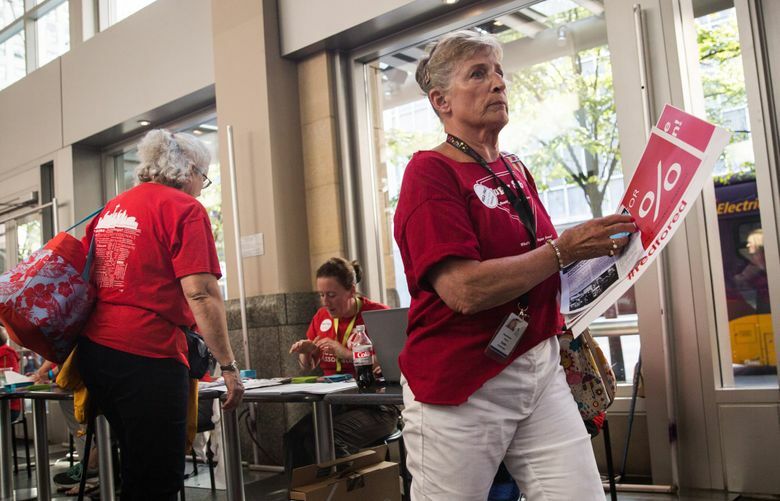 Union members will vote on the contract next Saturday at Benaroya Hall. The Seattle School Board will review and vote at its Sept. 18 meeting, said board President Leslie Harris. The deal also would increase the number of counselors in secondary schools and nurses, while expanding school-based racial-equity teams and health-care benefits for substitute teachers, according to an announcement of the tentative agreement posted on the district website Friday evening that was later removed. A different version was posted soon after. “Our team jumped the gun. In alignment with our agreement with SEA we pulled back the high-level summary,” the district said in a statement. Citing labor laws and a desire to respect union membership, the union and the school board and the school district have kept a tight lid on the deal. Negotiators have been meeting since May. After they missed last weekend’s deadline for reaching a deal, union members voted Tuesday to authorize a strike if both sides failed to come to terms before the first day of school.